Mood swings can come and go constantly before, during, and even after menopause. Although you may wait for menopause to end for all of your symptoms to magically disperse, this is not always the case. Some women continue to feel the grip of moodiness into their 70s, long after “menopause” is no longer applicable. The relieving part is that the reason a woman would continue this exhausting cycle of erratic emotions is because she was not aware of the root causes. Once you know, you can address them in a positive way. You may have heard many times before that estrogen levels drop dramatically during menopause. This is a huge factor when it comes to mood swings. Unfortunately, your levels stay relatively low after menopause as well. When such is the case, happy and relaxing neurotransmitters in the brain go down as well, which directly affects your emotions. To target this cause directly, you can consume phytoestrogenic herbs in tea of supplement form. The compounds will work in the body like estrogen and help level out your estrogen levels. Black cohosh, dong quai, and red clover are celebrated for their ability to tame estrogen imbalance, and thus, mood swings. Have a healthy eating pattern. Make sure to eat a well-balanced breakfast, lunch, and dinner each day. You can even break it down into five smaller meals to keep you energized. You should be eating whole grains, fruits, vegetables, and lean proteins to get the nutrients you need for emotional stability. The more colorful your plate, the better. Sugary and fatty foods should be in strict moderation. When you have an excess of desserts or oils, you may feel irritable, sluggish, and gain weight. When you do not get enough exercise, your worries will only feel much more pronounced. You never give yourself a chance to rise above the feelings, because you are too stuck in the same mindset. When you move through exercise, your thoughts can be raised to a more positive place. At the same time, the neurotransmitters serotonin and endorphins are released in the brain, providing sustained happiness and relaxation. To fight low moods, try up to 40 minutes of cardio in 10-minute intervals. To fight anxiety, join a local yoga studio. Women of all ages try yoga and report extremely positive results no matter their level. You may feel a bit cheated if menopause is over and yet you are still going through the explosions of tears, anger, or nervousness. It can be really hard to make it through, but when you understand the top three causes as outlined above, you will be able to make a positive shift in your life. Try these for lasting improvement of your attitude, and enjoy your life. What's the Difference between Severe Mood Swings and Depression? 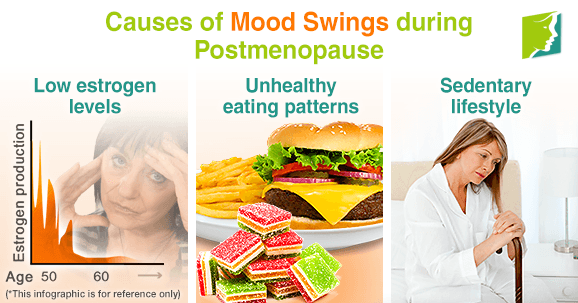 Mood swings are a common symptom of menopause. Click here to learn more. What's menopause? What can I do to help? It is common to have questions and concerns about your partners menopause. Get answers here. Read all about menopausal headaches and mood swings, including their causes and how to overcome both symptoms successfully.